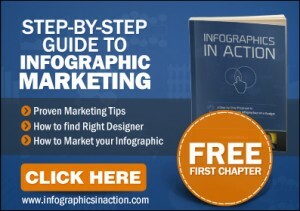 Is Your Business Right for Infographic Marketing? As content marketing has evolved, infographics have emerged as one of the most popular ways for businesses to convey information, promote their services, and even recruit candidates. It shouldn’t come as a huge surprise that infographics have gotten so big; they are visual aids that convey complex information in an easy-to-digest manner, and good infographics are both eye-catching and shareable. Since 90% of information is transmitted visually and 65% of people are visual learners, infographics are often one of the best ways for businesses to communicate with customers or clients. There’s no one type of business that is best-suited to infographic marketing, nor is there any specific industry that should steer clear of infographics. Because of the endless possibilities for infographic design and content, any business that has information they want to share can benefit from infographic marketing, whether they’re a small start-up or a large corporation, a B2B or a B2C. However, there are businesses that use infographics effectively and others that use them… less effectively. In order to determine if you are willing to put in the effort needed to maximize your infographic marketing, ask yourself the following questions. Do you plan to use infographics for more than just making sales pitches? As with any form of content marketing, infographics work best when they provide web users with useful information and actionable advice rather than just a pitch for a product or service. If you only plan to use your infographics as blatant advertisements, you’re wasting your time. It’s fine to include your business name and logo on the infographic to increase brand recognition, and you should be sharing information that’s relevant to your target market, but the focus should be on helping that target market and not just selling your product. Are you willing to do research? Sometimes the information you want to share in your infographic is already available through your industry or business, but other times, you will need to spend time seeking out reliable sources and researching to round your infographic out. You should be using your infographic to position yourself as an authority on a certain topic, and in order to do that, you need to make sure you’re providing good information. You might get this information by doing your own research, such as conducting over-the-phone surveys with your clients, or you might find it by delving into public databases, such as UN Data or the US Bureau of Labor Statistics. Make sure you’re using the most up-to-date information available, and be sure to cite your sources in your infographic. Can you figure out how to present your data in a new way? If you’ve gathered data from within your organization, you may already have new information to share in your infographic. However, if you’re using data that’s already available to the public, you need to think about how you can present that data from a new angle (otherwise, why would anyone want to share your infographic?). Think about how you can organize your data into a compelling narrative. Statistics on their own aren’t that interesting; it’s the larger implications that people are interested in. Can you present your information in a simplified way? Infographics aren’t meant to be text blog posts with one image crammed in the corner; they are supposed to be a largely visual medium, and as such, text should be minimal. If you’re going to use infographics as part of your content marketing strategy, you need to figure out how you can boil often complex information down into short copy and clear-cut design elements. You’ll most likely need to set aside time to send your infographic through several rounds of editing. Are you willing to design unique infographics? There are a lot of customizable infographic templates out there, but the problem is that these templates spend a lot of time circulating the internet, and web users can generally tell which infographics have a unique design and which were based on a form. Web users are much more likely to share infographics with a unique design, so consider hiring a graphic designer on a per-project basis if you don’t have the in-house resources to develop your own infographics. You can search for freelance designers on sites like oDesk and Guru. Will you make an effort to promote your infographics? No matter how well-designed your infographic is, it won’t do your business much good if no one outside your organization sees it. Infographics don’t just go viral on their own; you’ll need to share them on social media, create blog posts and guest posts about them, reach out to influencers who might be interested in sharing them, add social sharing buttons and an embed code, and share them on popular sites such as Slideshare and Visual.ly. Your business should only create infographics if you’re fully invested in promoting them. Infographic marketing is a great example of the expression, “If it’s worth doing at all, it’s worth doing well.” Infographics no longer have a novelty factor because they’ve become such a popular form of online content, so if you want people to actually share your infographic, you’ll need to focus on providing valuable information, appealing design elements, and a unique perspective.